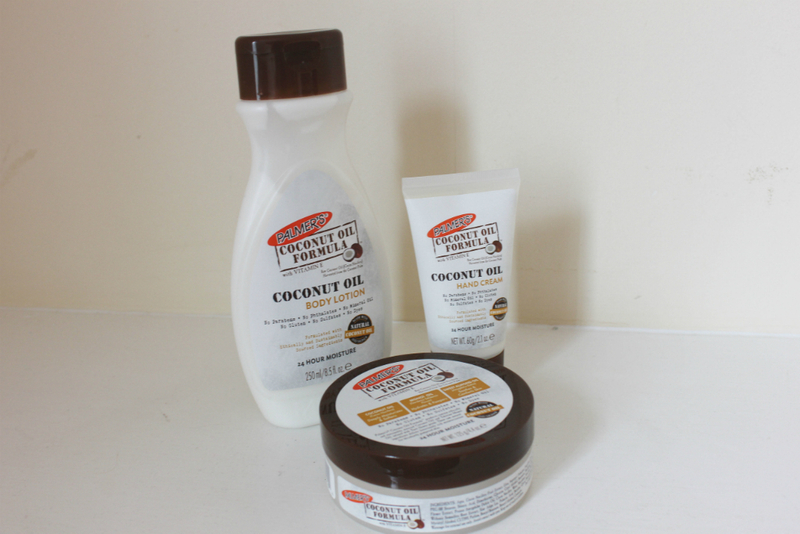 You’ve probably all heard of the Palmer’s Cocoa Butter Formula range. It’s one of my all time favourites and leaves you smelling like a big bar of chocolate (always a desirable trait), as well as providing lots of hydration for super soft skin. This summer, Palmer’s have honed in on the very versatile (and trendy) coconut oil trend to produce a range with the same hydration properties (if not better) and an amazing tropical scent. With no parabens, no sulfates and ethically sourced ingredients, it’s every bit as natural as coconut oil itself and provides 24 hour moisture (with a helping hand from some Vitamin E). The Body Lotion is probably my favourite from the range, as it glides on really quickly (there’s no digging around in any tubs as you can squeeze it out of the bottle) and sinks in super fast too, the ideal moisturiser for stepping out of the shower and engaging in the morning rush. I’ve been on the hunt for some new make-up brushes for quite some time now, with my original set looking rather worse for wear. I wanted something high quality that didn’t leave tell-tale brush strokes or brush hairs behind, without the extortionate price tag. L.A.B2 brushes were ones that I hadn’t come across before but after using them myself, wish I’d discovered sooner. They are made with FiberLuxe Technology, providing the softest and highest quality filaments. This means that the pigment ‘pick up and release’ is far better than the majority of brushes (you know the ones I’m talking about, you scoop up a trough of blusher, only for a tiny bit to actually go onto the skin). 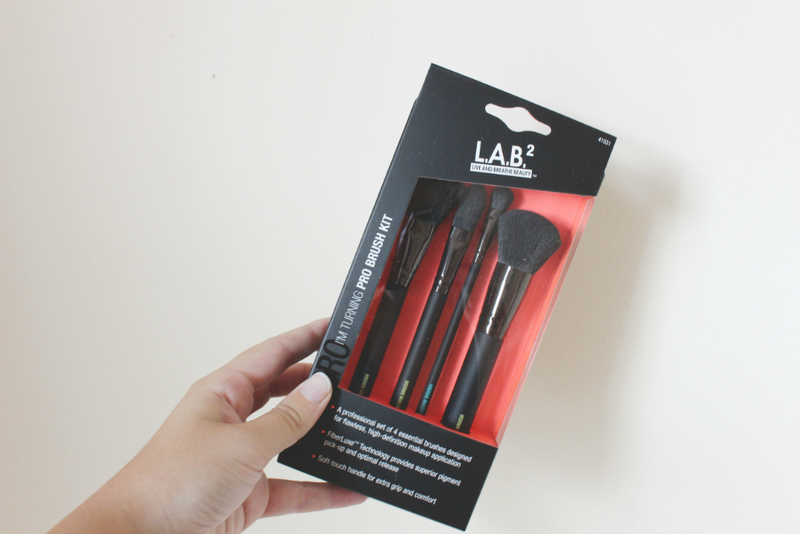 Their Pro-brush kit contains all the necessary ingredients for a FOTD, including a foundation brush, contour brush, buffing brush and eyeshadow brush. The handles are that super silky soft material – easy to grip and a centrepiece on your dressing table! From the outset, this tiny bottle of liquid might just appear to be a rather average soap. It doesn’t give anything away until you look closer at the packaging and realise what a multi-tasker it really is – it has 18 different uses! The ultimate travel companion, these little bottles cover pretty much everything you could wish for from a toiletry item. 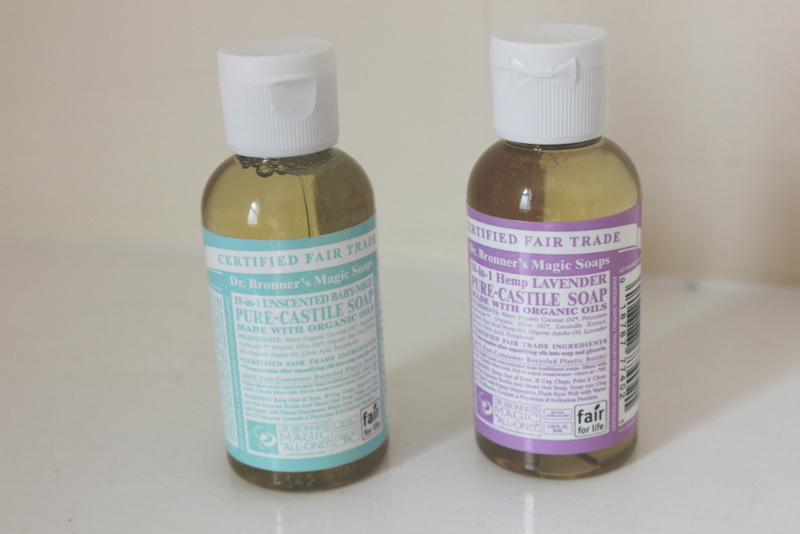 As well as a soap, these amazing bottles also double up as a face wash, shampoo, laundry detergent for on the go washing, antibacterial saviour (to heal and help cuts and grazes), a bug spray, a toothpaste and a mouth wash (the peppermint version is best if you want to use it for the latter). Yes, really. A celebrity favourite of the likes of Natalie Portman and Kate Hudson, these are a must-have for any wanderlusting traveller – as it will save you buying a million different lotions and potions for different uses, giving you more room for clothes and souvenirs! I have the little bottles (59ml), which are £1.99 each (yes, even affordable too) however you can also buy 473ml versions for £8.99 if you’re off on a longer trip. I can’t wait to take these away with me! If you’ve been reading my blog recently, you’ll know that I’ve been rather focused on gaining and maintaining whiter teeth recently (see here), whether that be in the form of actual whitening treatments or toothpastes and products which help speed up the process. 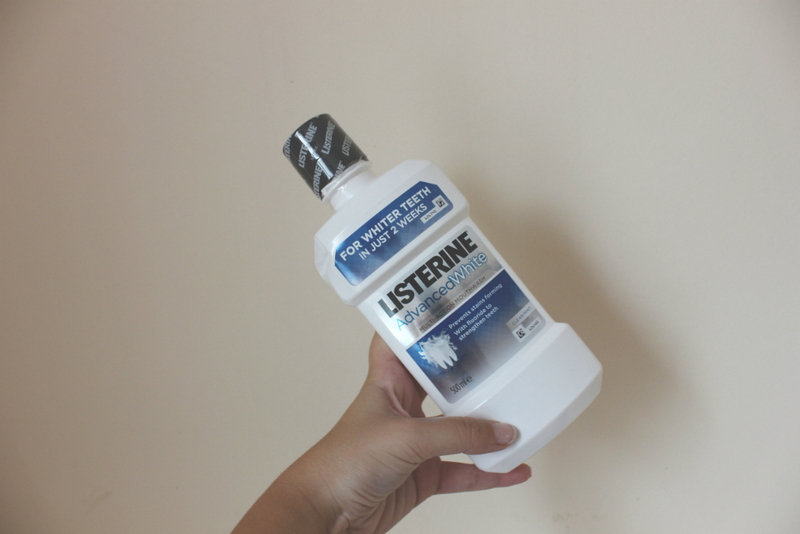 Listerine has always been my go-to brand when it comes to mouthwashes (you can’t quite beat how fresh your mouth feels after using it) and so when I spotted that they had a whitening version hitting the market, I couldn’t wait to try it out for myself. With a clean mint flavour, it’s very easy to incorporate into your daily routine and it claims to give you whiter teeth in ‘just two weeks’. I personally didn’t see a drastic difference in the actual shade, but I saw a huge difference after two weeks with regards to how pearly they looked. They seemed to brighten up my natural colour and accentuate the whiteness I already had, while of course ensuring I had very clean teeth and fresh breath. If you’re in the midst of whitening your teeth and fancy giving them a boost in the right direction, I’d definitely recommend giving this a go! 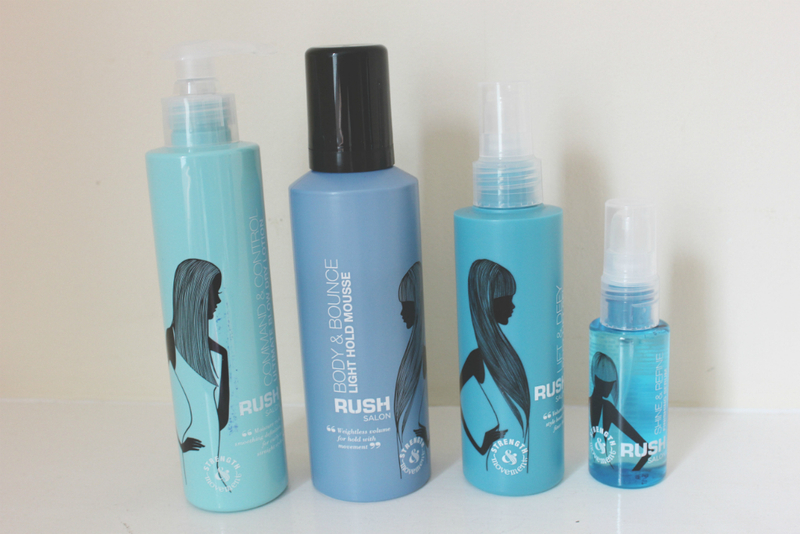 I visited the flagship Rush Salon in London last summer (post here), to experience their amazing Brazilian Blow Dry treatment. I don’t think I posted an official update on my blog but I was so impressed and the effects lasted for a good 3-4 months, in addition to promoting new healthy hair growth – which I was very thankful for. However naively, I didn’t realise that they had their very own range of hair products (if I had, I’d have been featuring them sooner) and so when I heard this, I couldn’t wait to try them out – with already high expectations of the results! Packaged in assorted shades of blue (which make for lovely bathroom staples), the range features a blow dry lotion, a root lift gel, a light hold mousse and a finishing serum. I’ve been trialling all four products for a couple of weeks now but my favourite has got to be the Root Lift Gel – which has saved my hair on a number of occasions. Unfortunately, I suffer from quite limp and flat hair anyway – especially on the roots and although I thought that cutting 5 inches off (which I’ve recently done) might have helped with the va-va-voom, it hasn’t. I love the blunt finish my new hair cut has but it’s ruined a little by the fact that the roots look like they’ve been stuck to my head. I know you can use dry shampoo after washing to give it lift, however I have quite a dry scalp anyway – so this causes havoc! The gel is non-greasy, non-sticky (and smells amazing) and is simply rubbed onto the top of your roots (with a kind of massage motion) to provide a little extra lift and volume. I’ve found it really helps if you have flyaway baby hairs at the front too – it just keeps everything really natural but a bit more polished! I also love the blow dry lotion, which has cut drying time almost in half for me (I’m not sure how) and helped maintain a more glossy finish. These have always been vital components for any girly night I’ve hosted – and bring back such fond memories of pampering sleepovers! I didn’t realise until recently that in addition to the face masques, the brand itself also offer restoring hair masques for a variety of hair related ailments – with fruity and delicious smelling ingredients. My current favourite is the Coconut Protein Rescue Masque for hair and roots which claims to boost volume for weak, dry and fine hair (which describes my hair in a nutshell). As well as smelling incredible, it’s super easy to whack on – leave for 15 minutes and wash off. It doesn’t weigh your hair down unnecessarily and leaves it feeling silky, smooth and soft – which is a rarity for my locks! 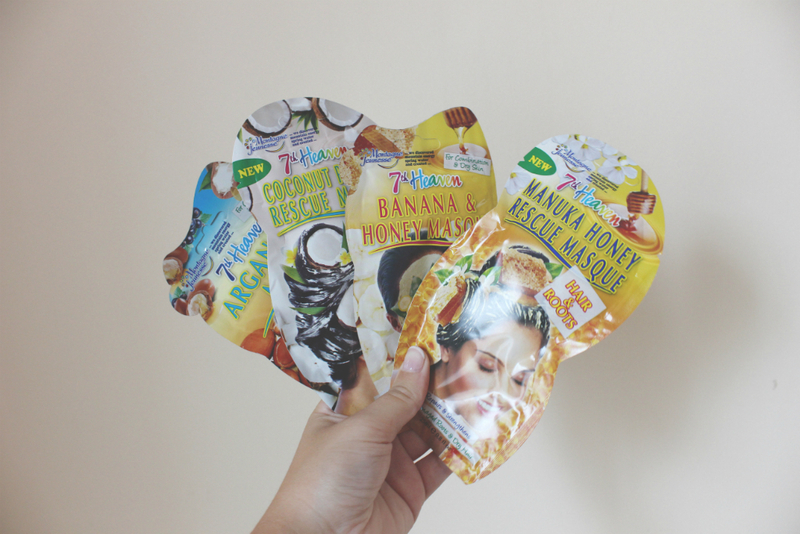 If you fancy a real pamper night and want to team it with a face masque, I’m loving the banana and honey version which cleans up your pores, soothes any irritation and any – leaves you with a silky soft finish! I travel lots and I’m rather forgetful – a combination which don’t usually work out well together. When it comes to make-up removal, I’ve usually always forgotten to bring with me what I normally use – so I’m left buying a cheap packet of make-up wipes (which I know is bad to use all the time, but it’s only a one off) and hoping for the best. However, I’m not sure what it is when it comes to make-up wipes, but they never quite cut the mustard with the eye area. I’m forever waking up with panda eyes, despite the fact me going to bed sure I’d removed everything. I think you need something a little extra usually, which isn’t harsh on the eyes – but is going to remove everything in one swipe. 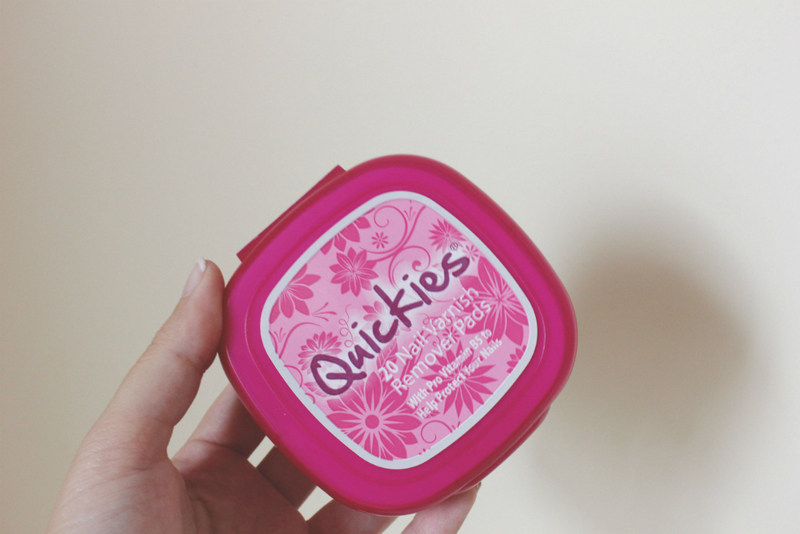 Recently, I came across Quickies – a range of pads for different uses (I’ve also got the nail varnish remover pads – which are so handy, I hate fiddling around with cotton wool and nail polish remover) and their staple is the eye make-up remover pads which are formulated for use on sensitive skin (a bonus for me). They’re very compact and I actually leave these in my suitcase now, so there’s no excuses – and they sweep away all traces of eye make-up without having to scrub or damage your eyelashes. They are fragrance and colour free – and even remove waterproof mascara, so a definite must have travel companion for any beauty lovers! I had an operation recently so I’ve been on my guard constantly for any germs – both pre and post the day itself. I didn’t want to get unwell and risk the chance of having to reschedule and similarly, I didn’t want to get ill afterwards when I was already weak and feeling horrible. So, in addition to eating as many fruits and vegetables as I could find – I’ve also been stocking up on my antibacterial products – one of which has been this first aid spray. Although I do really like the fast drying antibacterial hand gels, I do find that they can leave your hands feeling very dehydrated, so a spay seemed like a better option. Killing 99.999% of harmful germs (I do always wonder what the 0.001% it can’t handle is), it uses the body’s own natural antiseptic to assist with wounds, insect bites, minor burns, acne and sports and hand disinfection. The multi-tasking nature of this product has proved invaluable, especially as since the operation – my face seems to have broken out in an assortment of spots, which due to the nature of what I had done, I couldn’t use my usual skincare products to speed up the healing process. It doesn’t smell overly medicinal – which is great, and the spray element means that you can pop it in your handbag and use it anytime it’s needed! So you might be wondering – why on earth would an anti-aging product feature in a 21-year-old’s favourites post? Well, although these specific products are targeted at maturer skin, they’re actually fab for sensitive, dehydrated and very dry skin too. Some of my favourite moisturisers are anti-aging because they provide me with longer lasting hydration and seem to soothe the skin like no other. They can be a little a heavy at times, but as long as you don’t absolutely smother your skin in it – the effects can be amazing! The Love My Skin brand do things a little differently, featuring LED lights within their products for a more refined, even texture while boosting your natural collagen stores. I truly believe when it comes to this, you can never start too early – and so I was intrigued to try these out! Essentially, you use the compact pen or palette within your usual skincare routine and gently illuminate the area of your face you wish to treat. When it’s finished, it will beep and switch off automatically. I have been using this for a couple of days now and have already seen the drier areas of my face (I have patches on my t-zone which are ridiculously dry) improve. It’s a bit of an odd concept really but it uses red light therapy – and I think it could be where the future of beauty is headed! A sci-fi facial but in the comfort of your own home! 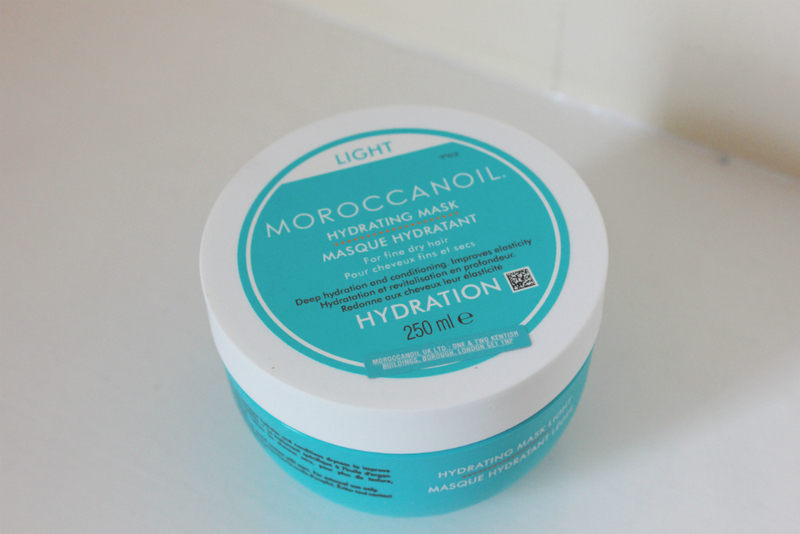 Moroccan Oil are one of my main go-to brands when it comes to haircare, as you can always rely on them to provide a bit of TLC for your locks when they need it most! The new ‘Light’ hydrating masque provides deep conditioning treatment for fine dry hair (mine ticks all those boxes). I use this once a week for a really effective ‘pick me up’, using anymore than this and you might not see the same effects as your hair becomes used to it. In addition to the silky soft finish it gives (especially if you blow dry after, this seems to activate it more), it also leaves your hair smelling amazing! For an extra boost, dampen your hair slightly during the evening and leave on for 20-25 minutes. I like to do this if I’ve been on holiday and had too much sun – or if I’ve just had my hair highlighted, as it somehow mends all my hair woes! As you may know, I suffer from very dry and sensitive skin. I’ve written lots of posts in the past about finding the right balance of skincare to suit these issues, however it wasn’t until my dermatologist mentioned that not only the products you use on your face – but the rest of your body, can affect your skin (and face) as a whole. Even your toothpaste can sometimes contribute to sensitive skin flare ups – especially if it contains fluoride. So, whenever I spot a new range with these kind of troublesome skincare issues in mind, I’m eager to give it a trial run. Urtekram is a Danish brand, recently launched in the UK – and is set to take the hypoallergenic market by storm. It doesn’t compromise on attractive packaging or nice scents (they’ve certainly nailed this too), but it is certified organic and contains only ingredients that don’t irritate flare-ups. 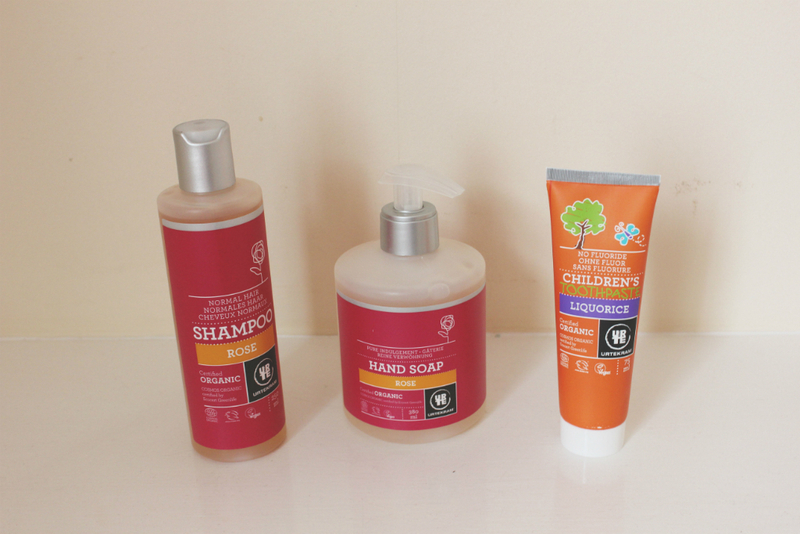 I’ve been trialling their hand soap, liquorice toothpaste (which is much nicer than it sounds) and rose shampoo (which is great for sensitive scalps). A main ingredient in each is Aloe Vera, which is renowned for its natural healing properties on the skin – and I’ve been loving using these, as they’re so soothing. Available at natural health food retailers nationwide, prices start at £1.75. I have a slight obsession with collecting lip balms, to the point I actually have an entire drawer full of them at home. Oops. However, despite this hobby of mine – I never seem to have one on hand to quench dry lips when I’m out and about. I’m forever taking them out of my handbag and never popping them back. So, when I noticed that Beauty Kitchen had a pocket range available – with handy sliding tins that fit into even the tiniest of handbags (even a clutch), I couldn’t wait to try them out. 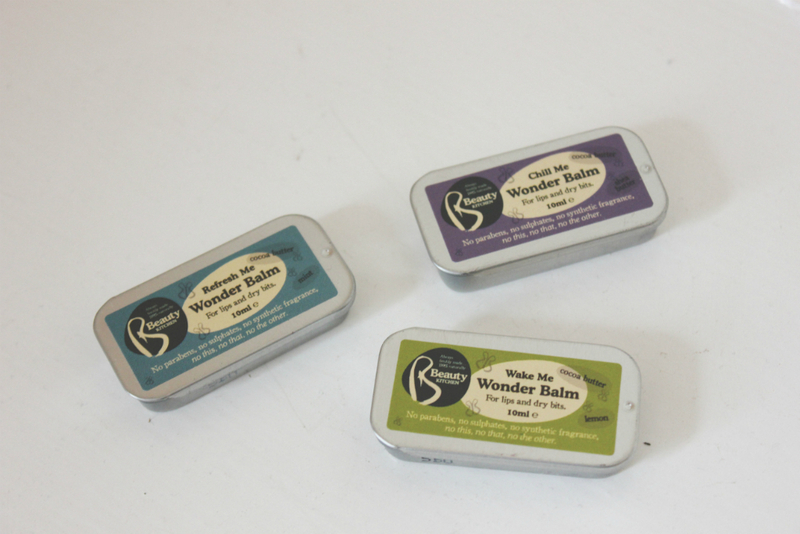 The range features a ‘Wake Me’ balm, with cocoa butter and lemon, a ‘Chill Me’ balm with cocoa butter and shea butter and a ‘Refresh Me’ wonder balm with cocoa butter and mint. They’re all natural, so won’t dry out your lips more (I’m sure you’ve all heard about the lip-balms that eventually dry out your lips more than when you starting using it – encouraging the use of their product) – and they contain no parabens or synthetic fragrances. A refreshing change! I absolutely love them and have popped one in each of my three alternating handbags, so there’s no excuses next time! I’ve always been more into showers than I have baths, I’ve never really found them as relaxing as everyone makes them out to be – however recently, when I had to have baths instead of showers due to an operation, I rekindled my fondness for them. Especially when they involve lovely scented oils, foams and bath bombs! They make things feel a little more pampering rather than routine! 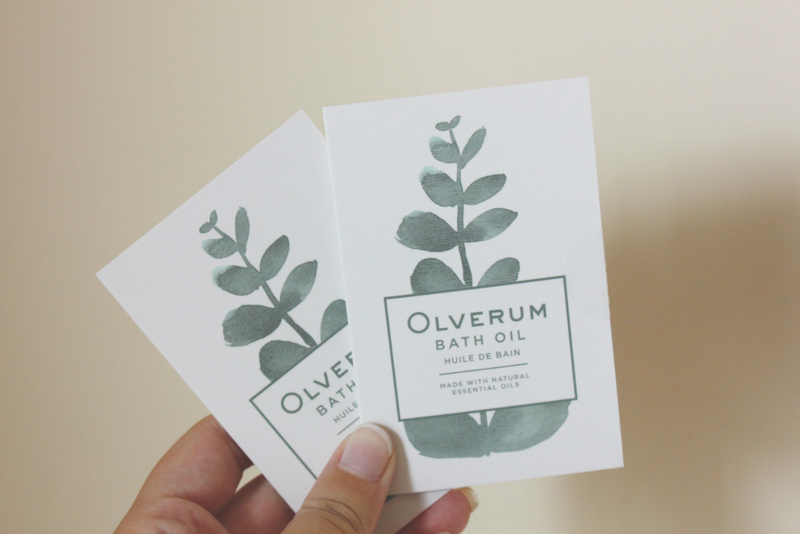 Olverum Bath Oil has been a great one for me because it’s all natural and doesn’t interfere with my sensitive skin – in fact it’s really helped with the dryness! A unique blend of essential oils, the formula helps relax tension and ease stress – something I can definitely vouch for these last few weeks (more on this later). You only need a very small amount (about 5ml) to reap the benefits, which is why these sachet samples have been really helpful. I think you can get the oil in bottle form too, but for now – I’m enjoying using these sachets! I’m very fussy when it comes to false eyelashes, because they can look ridiculous if not chosen to suit your eye shape and natural lash length/texture. Obviously when you’re making the effort to use them, you want a more dramatic look – but not so dramatic that you upset the locals when you venture out. 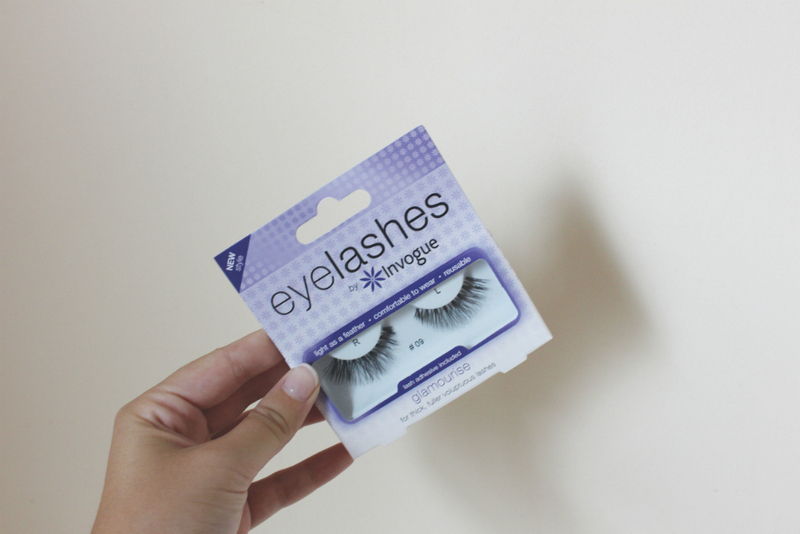 I recently discovered Invogue lashes, with a range of natural – yet thicker and fuller – false lashes. They’re super light wearing, so you don’t feel as though you’re lifting weights with your lids every time you blink – and they’re also reusable, as they don’t break off when you remove them after your first use. 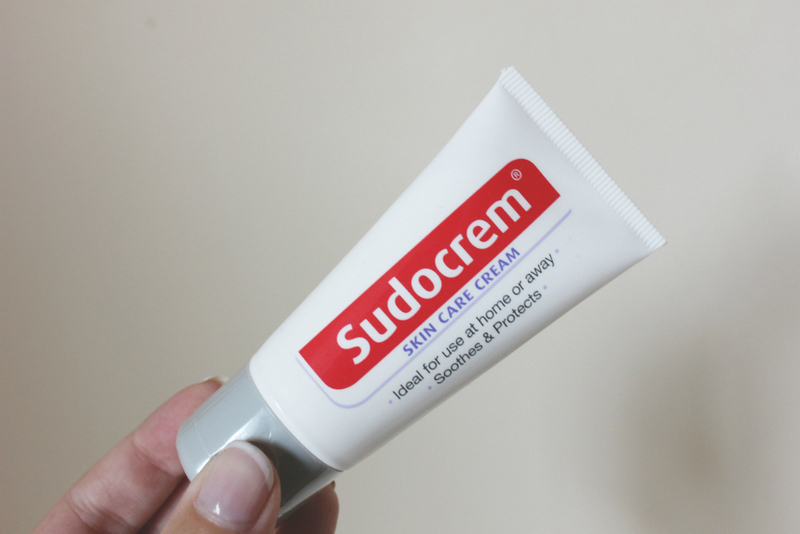 Sudocream is one of those handy things that everybody needs in their life. A cure to an assortment of skin issues and ailments, it works wonders on soothing the problem in hand and resolving things. Although I’ve always kept a pot handy in the bathroom, sometimes these skincare issues crop up whilst your on the go – and digging your fingers into a mini pot with no towel or tissues to mop up was a bit of a hassle. Luckily Sudocream has realised this and brought out the same formula in a squeezable mini tube form for saving skincare woes, on the go! I love this stuff – it’s a must have! I’ve recently undergone a teeth whitening treatment at a dentists (you can read this here), so admittedly my teeth weren’t overly bad to start with however I’m working with Doll White for the upcoming Bloggers Festival (not long now – eek) so I wanted to try them in advance to make sure they were something that I thought you lovely people would enjoy taking home on the day and trying out for yourselves. I’ve actually never used strips before and I was worried they’d feel odd in my mouth (or create that horrible sensitive sensation), however I’m pleased to say that this didn’t happen. 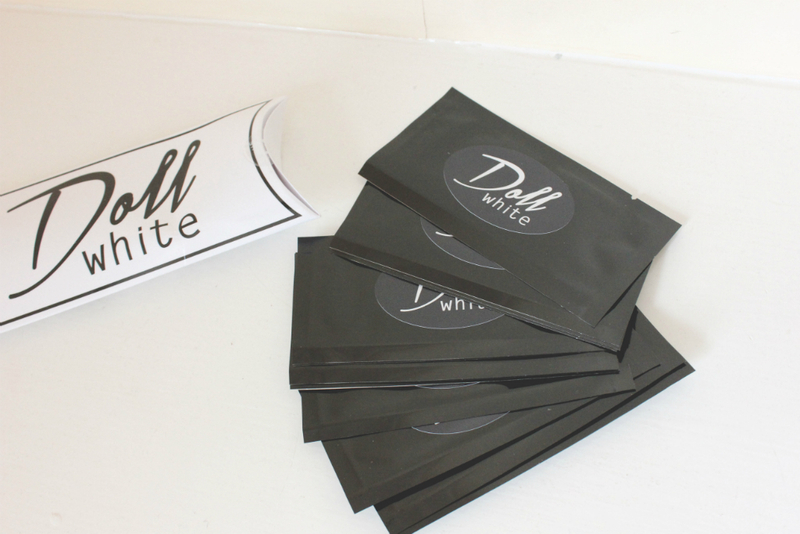 In fact, as far as whitening strips go – these are probably the safest bet, as they’re non-peroxide and won’t damage your teeth or gums. They will however, create visible results within 14 days and remove any tea/coffee stains. They were super easy to apply (one strip for the top, one for the bottom), which I used in the morning about 30 minutes after brushing. As well as the bonus of whiter teeth, I found that these left your mouth feeling really minty and fresh – which I loved! A 14-day pack is £19.99 and I would recommend sticking to 14 consecutive days to maximise results, but if you’re looking for an affordable (and safe) way to whiten your teeth, these are certainly worth a try! All attendees of my upcoming Bloggers Festival (my events information page is here) will take home a couple of these strips to try for themselves if they fancy – so I can’t wait to hear if I’m the only one who loves them! Do you have any favourite beauty bits you’ve been enjoying this month? I’d love your recommendations!